WATER HOUSE MAKE A SPLASH! 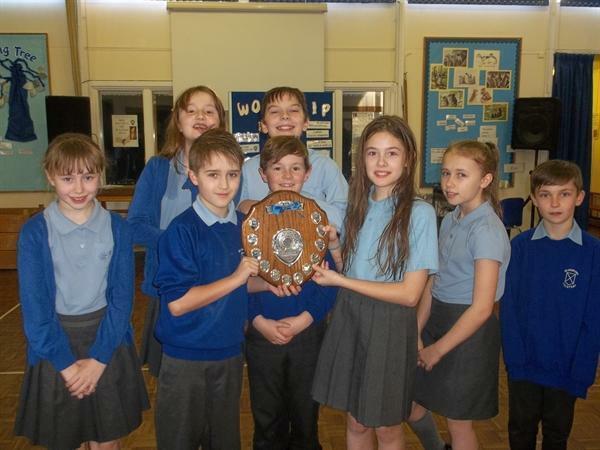 Congratulations to Year 6 Water House on winning the House Swimming Gala, but with only 3 points separating the top 3 teams the competition couldn't have been closer. Just a fingertip separated Rosy (Air) and Ben (Earth) in their 50m front crawl race. The 25m front crawl race was equally fiercely contested as Sam (Air) and Mia (Earth) touched within a fraction of a second of each other. Ellie (Air) and Lucy (Water) produced another nail-biting finish in the 25m breaststroke race. Liam (Earth) clinched victory in the 25m backstroke race. Despite gaining 3 individual first places Air House had to settle for third spot overall. The relays carried double points and it was here that Water House showed the strength and versatility of their team. They took first place in the medley relay and second in the freestyle relay. Water House Captains, India and Jack, stepped up to receive the shield on behalf of their team. Results: 1st Water 2nd Earth 3rd Air 4th Fire Congratulations to all our Year 6 swimmers on a wonderful sporting contest.